Well the end of an amazing season back in the PL. Finished 2nd in the end, never really threatened man u who won it easy. Did win the EFL cup with a battering of Stoke in the final though. 3. Berahino took a while to get going, but in the end got 23 goals an 14 assists from 42 games with an avg rating of 7.38. Cost me nothing too. 4. Jansson was a rock, averaging 7.48 across 44 games as captain. Have already got into pre season for next year where our assault on the champions league begins. I'll settle for a good run in that and a top 4 finish again. I got £53m to spend but my wages are getting a bit out of control, will post a bit later with finalised transfer dealings. One I missed out on was Luan, he ran his contract down and although I bid £2.5m and got accepted, he just wasn't interested in talking and went to Porto instead. Bazoer and Lemos are the world class players I needed, approached this season with the view that 2-3 world class players each year will see me properly competing next season. I've used the loan market better too, Mayoral and Kimpembe are very good players already, I can't afford either of them perm, but they make the squad a lot stronger. January / next year I'll be looking for a proper world class AMC (Berge will probably make way) and if I can find a monster ST, Preciado can go too. Also need a RB as Man City are sniffing around Manquillo and I have nothing of note at cover. Charlie Taylor was always coming back, allowed me to let Saborit go for £6m and just about a straight swap. Steel is a regen GK my scouts liked a lot. I have my laptop back! Just heading into the busy festive period 3 points above the drop zone and Jordan Rhodes has just got injured ?. He's on a poor run, but my only fit forward is now Roofe!! Drawing a lot of games but a serious lack of fire power is hurting me. We have over £20m in the bank but Massimo is giving me nothing at the moment. Need two attacking payers in Jan.
Dembelle is at Stoke on my game ?. what formation did you play in prem and how did you set them up? Cracking season. 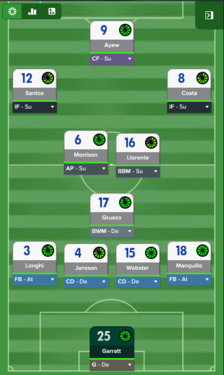 It's a 4312 narrow, nothing special, to be honest I usually now just download a tactic that has some decent reviews and has a style that I like, then tweak the player roles and positions to suit. I wanted to play narrow this year as there's usually an abundance of quality CM's available and I also wanted to play 2 strikers. 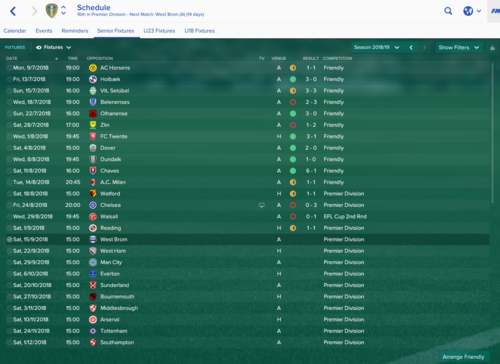 Next time I fire a save up (probably after the Jan window) I may go 442. I used to be into the tactical side of the game, but it's outgrown me for the last few versions, so now I focus on squad building. My success is in the majority down to the fact I got lucky with Dembele and Berahino. thanks mate. Burke just got injured for 5 weeks so I've played 4-1-3-2 for last 4 games and won 2 and drawn 2 with a poor side so I think ill use that until the end of the season. £30m in the bank and they wont give me any transfer budget despite trying to get me to sign a new contract. Had to sell Dallas for £2.5m to raise son cash for loans to get me some striking options. Was desperately holding on at the end but a win against Man Utd is always sweet no matter how it comes. Great post & I`m not even a Leeds fan, you prob know that don`t you! 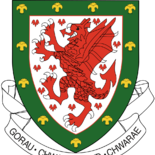 On work permits, the earlier post from Welshace explans the point system used in the game for the award of permits. The likes of Romero are not going to be awarded enough points to qualify early in the game for a work permit. The only under 21 player that I've seen in an early Leeds game to date obtain a work permit is Lincoln. But it is certainly rare. Get the Board to extend the scouting range. The easiest way to do this is tell the board that you want to sign young players for the first team squad and develop young players when you have the initial conversation with them at the beginning of the game. The Board always agrees to this. Then ask them to extend the scouting range. Because of the agreement on young players etc. they will usually allow you to do this. Then get your scouts out searching. They will most likely not come up with many players who will qualify for work permits. But, if they do, they will tell you. Mostly they come up with the 'good chance of a work permit on appeal' statement. At this point I assume, without any further scouting to 'firm' this up, that they will not get a work permit and I do not progress a transfer or contract negotiations. The only exception to this is if the player is a free transfer who I'm intending to loan out to a foreign club, get his wages off the books before a future sale. Like Olaza for example. What I then do is manually look through leading sides for players and here the reputation of the club and the country that it is based in seems to have a bearing here on the future work permit decision. As does the world status of the country of origin of the player. So in South America for example, a top player from a club in Argentina, Brazil, Colombia and Ecuador is more likely to get a work permit than a player from a club in Peru or Venezuela. Age and value are also important to begin with. I'm looking for players of 21 years of age and older who just 'look good'. So Luan at VDG is a good example. He just looks like a top player and when you consider his value and that he is at a decent club he stands a chance of getting through the system that Welshace described. I then ask a scout to do a report card to tell me if he will get a work permit. Early in game a lot of players will show in the report card that they have 'no intention of joining' you, but I ignore this. Although more often than not you get the message in red confirming this when you begin contract negotiations. However, sometimes you get lucky and you then enter negotiations to sign the player. You're most likely going to have to pay well to land the player. I've now had three Leeds saves and there are a very small number of players who will get work permits, will come to Leeds and are good enough to do so. For example there are a group of Ecuadorian players who will get permits, but with the exception of Angel Mena (and a few more I'll post on later), most are not good enough to sign. There are a good number of players in Colombia who are of good quality, Preciado is a fine example, and who will get permits but most don't want to sign. The big pity with this is that there is amazing value to be had for the quality of player. Which is why I'm looking at them. It's hard early in game to find players who will instantly improve the side. But they are out there. Like Macca, I love the squad building element to the game. Macca, what a great season. Fantastic too to see what Berahino and Dembele did for you. Clearly, top, top players. Meanwhile, like you I'm enjoying the squad building dimension to the game too. Especially at game beginning. I've come up with a couple of top prospect players (like your Soler) and I'll post them soon. I've also found a few more cheap Colombians and Ecuadorians who walk into the side. I'll post them too. ok got through to the end of the transfer window of first season back in the prem. Happy enough with the signings, hoping Ravel Morrison comes good but just waiting for him to go AWOL! Finally managed to get Pontus back after chasing him all season and having to get rid of some deadwood to free up the funds. Antonssen had to go, just not sure he's got it for me on the prem. Looking forward to seeing MaManquillo bombing down the right and Rodriguez could be an absolute bargain. Pre season went well and confidence was high but its been a tough opening month and the defeat at Walsall, even with a second choice XI, was very disappointing, Hoping to be able to push on as the season progresses but can't see us challenging for any honours and i'd take 17th if offerred even now! Intention first season is to keep the squad as real and original as possible, so kept Charlie Taylor on. Let Dave go for £1.1m as too many CMs and frozen out in real life, brought in Puerto for cover at CB. Top of the divisions avg rating, top assists with 11, 4 MOM awards. Corner taker, Free Kicks , crosses crosses crosses. Can squeeze out of Leicester a £7.5m fee, plus £1m over 12 months,plus £1m after 50 games, 50% profit next sale, and a bonus of £5m if a 4th place Leicester don't get themselves relegated. Downside there's a buy back fee of 17m . That's nearly £15m for him and i'm still dithering what to do. Main target is Mings but hes not interested. Scouts recommendations Fox at Charlton, Cunningham at Preston ,James at Wigan and Shinnie at Aberdeen. I've not played the game for 3 days to think about ! Help me out guys ......What would you do ? Hi - Get rid. Unpopular vote, but it's a fact. The money will keep you in the Prem next year if you invest wisely, is Haidara available for loan, take a look at Garbutt too. Also I signed Enric Saborit in my game, he was just as effective, got him for next to nothing from Bilbao. Taiwo will do you a very solid job until next season too (when Mings will all likely be available at a knock down price). Definitely sell.. you've kept him for a while and you'll never see money like that for him again.. he won't stay whatever yo do. If i read in the Yorkshire Evening Post tonight that Taylors off in real life, im taking the money. take the money. I checked with SI and he is set to release so even if you go up you can't offer him a deal so take the cash and you need it in first season in prem. Absolutely right, sell all day long. Have you looked at Cristian Ramirez? Juan Mojica? Will Edwin Velasco come to you? Will Miguel Trauco get a w/p yet? Haha, take it now, if you can get Garbutt and Saborit they are all day long good enough for 1st Season in Prem. Past the Jan transfer window, no deals, i'm pretty happy with the squad and want to save money until the summer, see what's available. Only summer transfer I forgot to mention was Byram, got him back just before deadline day on loan with a £2m option to buy, oddly west ham only wanted £10k per week, so financially loaning him first was the best deal. I'm after Cook in the summer, then I'll have him Taylor, Byram, Mowatt & Vieira in the squad, just how things should be. Bournemouth are wanting £40m though, negotiating will have to happen. This lad is unreal though, won the Golden boy award whilst on loan and he hasn't even been starting every week. Real want circa £50m for him, and i'm actually considering it, I could get £20m+ for Preciado. Just posted in the buy/sell thread, but what do you think? Man City have come in with a £60m bid for Lemos (£22m up front + £38m over 2 years), he was great last year and was probably going to be captain. Obviously depends on if adequate replacements are around...and whether the finances are up to scratch.. i.e do you need the 60million? Not especially, I can get Dier for £35m who looks good (and English). The issue is he actually has a £41m release clause, so if I reject and he get's unhappy I could lose him for less (but it would have to be upfront). 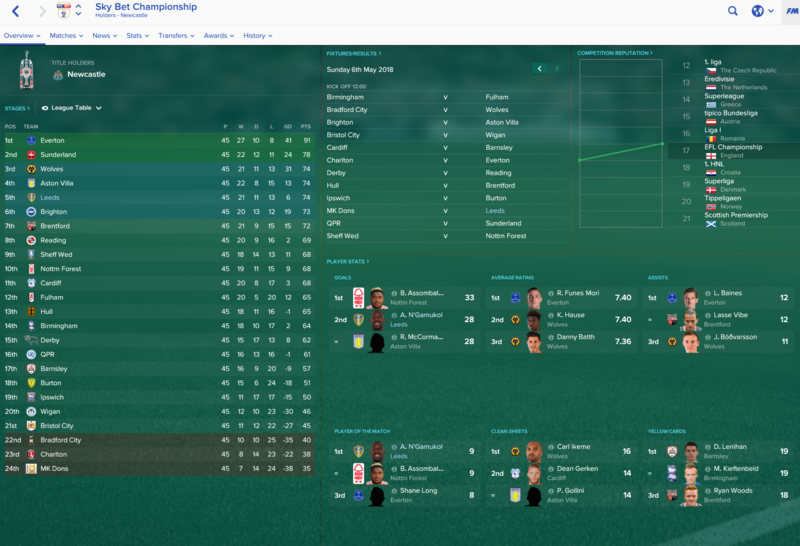 just won the league cup in season 2 beating Arsenal reserves 3-1, so into Europe next season. Heading for 11-13th in league with a handful of games left. big summer of squad building ahead. Missed play off by 2 points in the first season. Guys - quick update on the go. 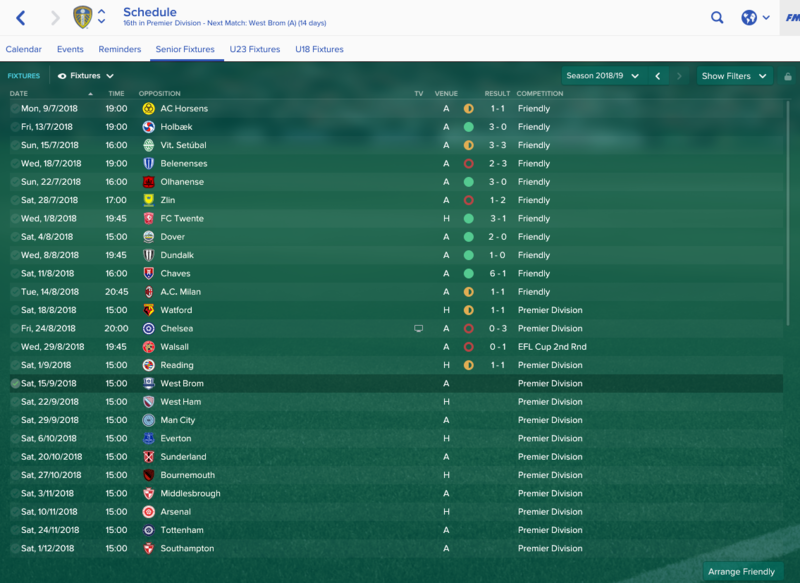 10 games into our first season back in the Premiership and we've had a solid start. 5 wins, 2 draws and 3 defeats. We got deserved draws away to man city and arsenal as well. Pleased with how the team has been playing. Antonsson top scorer so far with 8. Ayew has 6, Roofe & Sergio Leon have 4 each. Mowatt, Vieira and Rossitter solid in midfield. Mings is an absolute beast and Stephens & Bartley are forming a decent partnership. we also through to the quarters of the league cup after a thrilling 4-3 win over Liverpool at Elland Road. Drawn against Norwich away. Next update soon - good to read up on everyone else's games! I have been playing 4231 wide for most of season and so the goal spread could be my tactical fault. 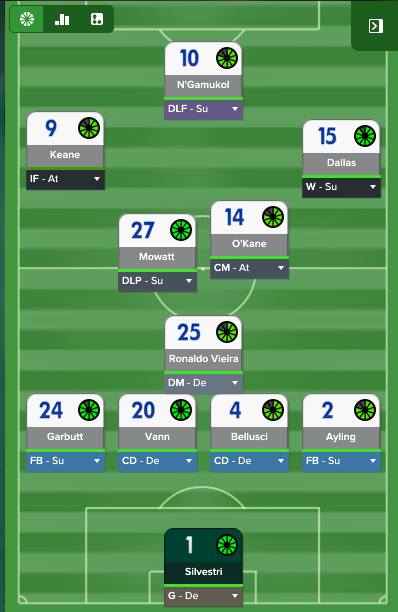 Has anyone else used this formation with Leeds and managed to get their strikers into 20+ goals ? There are various buy options on my loaned in players and I am wondering which, if any, I should take up. I am tempted to buy Pontus, Stephens, Sacko and Adomah but this will take up nearly 10m of my budget. Have any of you any experience of playing any of these 4 with Leeds in the Prem? I've broken my new save with Leeds.. I discovered I can sign freebies and sell them about a week later.. means making money is fairly easy..
Won't share the players I did this with unless asked as it may spoil the game for you. Yes you can make a small killing. I wondered about this when I realised that you can sell practically all of the first team squad (even though the likes of Bridcutt, Ayling etc are first window signings) straight away. You can literally do this as soon as you've signed a player and indeed the longer that you wait then the harder it gets. Interested clubs run out of money i guess? I couldn't bring myself to do it because it didn't seem 'right' some how. But I wasn't this ethical about signing unknown Colombian players..
First season back in the prem completed and got to say i was rather srurpised. Althugh i never dropped into the relegation places i was always bobbing around 14th to 17th with away points being very difficult to get hold of. But a 10 match unbeaten run from February saw us climb clear of relegation and dreaming of a surpise push into Europe as the league was pretty tight but only one win in the last 5 put paid to that and we ended up a very credible 11th place with an FA Cup semi thrown in (lost to Chelsea of all teams). Jordan Ayew top scored with 13 league goals but Ravel Morrison chipped in with some important ones from midfield and Adam Webster was a rock at the back. Amazingly the board are expecting us to battle bravely against reglegation again this coming season so i feel like its a pressure free one as we should push on. The squad has had a major overhaul but all the inoming transfers should play a part this year, particularly glad to have finally got hold of MArcelo Silva as i've been chashing him since the start of the save and Sundli and Vera should be a centre back pairing for a few years. I managed to keep Lemos for another year, but he eventually broke me. I could only renegotiate his contract with a £61m release clause and Man City came in with that and took him away. Shame really as he's arguably the best defender in the world. Season 2 finished. The highlight beating Arsenal reserves 3-1 in league cup final, so into Europe next season. Finished 14th in league and finished with a poor run of narrow defeats. Big summer of squad building ahead for European campaign. Pretty much my entire squad (inc Jordan Rhodes, who like real life ain't good enough for PL) is up for sale except 4-5 players. Need a massive injection of quality, but waiting to hear what Massimo is to offer £ wise. Southampton invited me to interview. I declined. Go on then, I'll bite; why? A nice dual Italian or Spanish nationality maybe? No sadly not.. I just meant, in a few saves now he's come out looking great, but thus far has failed his wp for me.. might be lucky in saves later down the line. I'll have a good look at him. I see that scouts' reports on work permits has been 'tightened' on the new patch and it is much more precise. Random one, but I've just finished January window in 20/21 season and thought I'd have a look at Man City's transfer history. It's totally bonkers. They've spent £746m in 5 years. EDIT: I've just accepted a £90m bid from them for Berahino. Good to see lots of people getting Leeds in to the prem on 1st or 2nd season. 1st season I lost out in the play-off semis and 2nd season lost out in the play-off final. 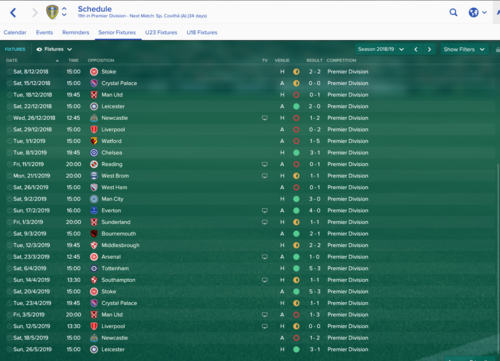 3rd season I am looking more of a force and am challenging for automatic promotion. Kevin Lasagna being a big part of that. Also recommend Angelino (Man City) as a replacement for CT. Got him in 3rd season after using Stephen Hendrie as a 2nd season stop gap. so... preseason wheeling and dealing done ahead of season 3 (my 2nd in Prem). Massive squad overhaul as you can see from the below. Bournemouth went down so I raided their squad. Lewis Cook was available for over £20m but I got two of their midfielders for that so decided against it. Played one competitive game in Europe and Wilson got a hat trick on his debut, so I think he will be a massive player for me this season. 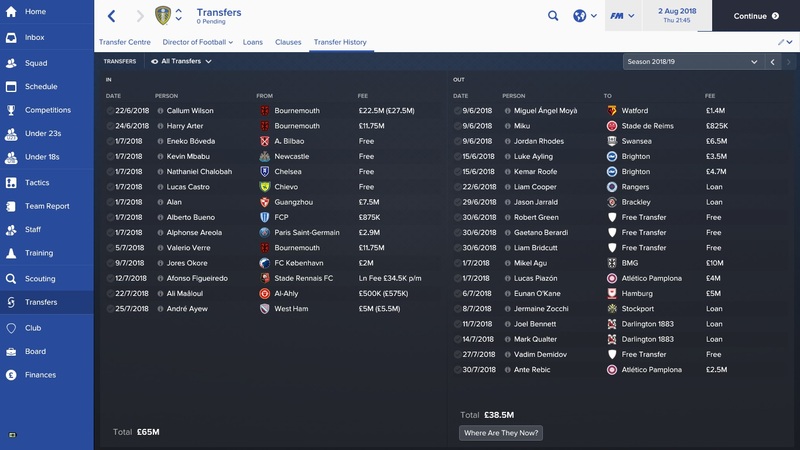 Massimo gave me a £50m budget initially but I have used a good chunk of that on wages to get the players in I wanted. Also switched tactics to a 4-3-1-2 which has seen me beat Man City, Dortmund, Wolfsberg etc in preseason. 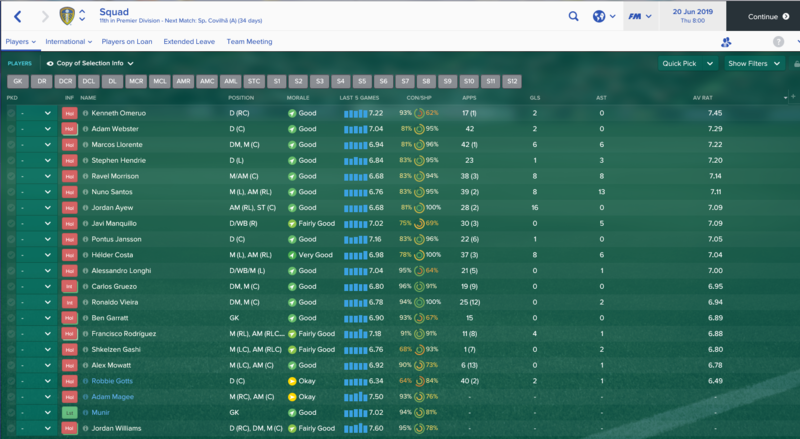 Viera and Mowatt are both now on the bench and I have turned down offers for both because I want to keep them with me. The left back and Okore are absolute bargains. In addition to the below I brought in Byram on loan with a view to a permanent (£2.5m agreed) on deadline day. Charlie Taylor is also transfer listed for £1.9m, but wont entertain a return to an LUFC side in Europe after only making 6 starts for palace. Was going to make him my back up left back. Will update more when I get stuck in to the season. After much deliberation and advice on here i reluctantly let Charlie Taylor go in January for a with clauses total of £14.25m, brought in Mings on loan and Mavinga for cover. Seemed to notice when Bridcutt was injured or suspended we lacked bite in the middle, so Swindon's Yaser Kasim came in for £850,000. Squeaky bum time -Two wins in ten through Feb and March saw chasing teams close the gap. Would love to scream 'the patch ruined my game, but major injuries to Bartley, Bridcutt, Wood. Janson suspensions ,unfit replacements and chopper Berardi. Beat Man Utd (reserves) in the EFL final. Mings sent off early on, Ajdarevic penalty winning it in extra time. In the FA Cup ,after beating Villa, Man City, and Liverpool another final v Man Utd awaited. Been given a £20 million budget , Jansson , Mings , Sacko and Bartley signed up permanently. Tried to sign Preciado, bid accepted his agent came in with some demands, more coaches, more midfielders, use club as stepping stone etc. Then hit me with a none negotiable £29k a week wage, so he's a no no how did anyone manage to get him. Looking at these anybody had experience with any. Sporar is great but expensive and not really much better than what you have. In terms of Preciado. You have to keep your eye on him, clear your wage budget down and sell first so you can offer 25k per week as a max (this does involve getting rid of some of the higher earners). If (and it's a big if) other clubs haven't come in for him in the meantime, or at the same time you did, the later the window goes on the less he will accept. You just have to watch closely. Agree with Welshace on the rest. 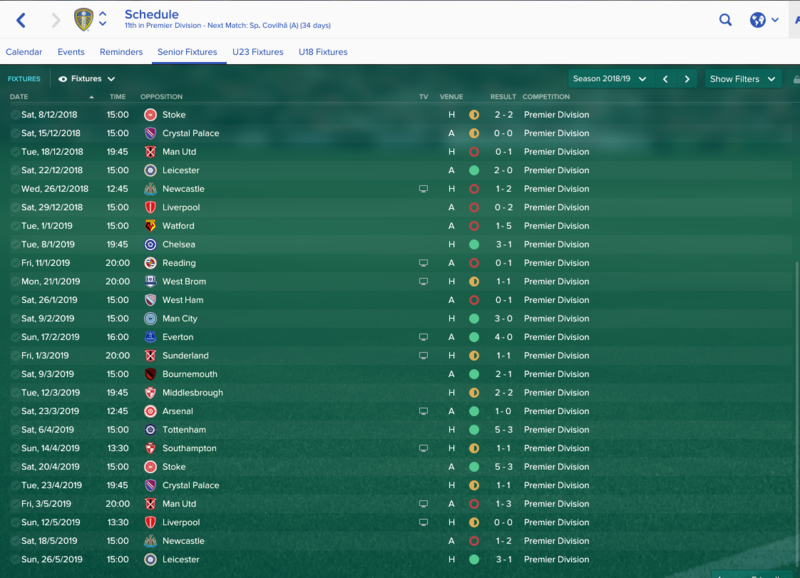 Hi all, can any of you recommend some first season signings? I'm looking to off load a few players to free up funds, firstly Taylor due to the contract problem. Has Brexit happened for anyone yet and what was the outcome? Currently starting my 3rd season, 6th placed last season in prem and playing EURO cup this season. It seems I have a very good team but I've been struggling with results. And advice on tactics or signings? 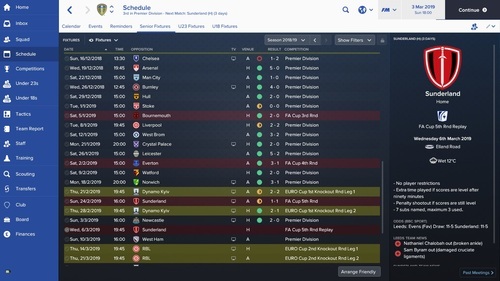 Is this year's FM really tough or something? Getting very frustrated here with the Leeds save. Each year I play the demo, get an idea or plan of what I want to do in the main game, then tackle the challenge of the main game then. But this year's demo, my god. No matter what I do I can't seem to get a consistent run of good results? Is the Leeds game in the full version really tough? I know with the demo I'm really limited as to who I can buy etc which doesn't help. I mean there doesn't appear to be any decent strikers available to buy. I don't like playing with A target man (that's all Wood can do) as it leads to too much lost possession. I don't like playing with a line advanced forward (Antonnsons best position) leaving only Doukara and Roofs who aren't great. Who would you set up the team to replicate the way Monk has them playing. I'm having no success at all. Have you had any success with any tactic? I seem to suffer from lack of goals even when playing a control strategy. I look through the side and wonder who's going to score enough. I brought in Bradley Dack, Marcus Maddison. Even Nicky Ajose looked appealing to me compared to what we have. Any advice guys to get me ripping it up in the demo so I can take that into the full game? I also have a 4132 that I use if opposition play high wingers. Roofe plays ok as a F9 and others had good success with Antonson if you read the previous posts. Good luck! I managed to finish season 3 last night with an FA cup win over West Ham (3-0) and finished 4th. I lost a couple of games against teams who parked the bus and drew at Arsenal. It boiled down to a final game at home to City to see who would finish 4th. They were 2 points ahead. In the end we battered them 4-1. Got beat by AC Milan in the quarters of the UEFA cup (or whatever it is called these days). Wilson would have won the golden boot ahead of Aguero had he not missed the final month of the season. Byram has done his ACL so that will rule out permanent transfer at this stage.